Mint state and key date listed Shield Nickel values is for graded, certified and authenticated coins in PCGS or NGC holders. The rest are a sample of raw coin sell but this is not a guarantee your coin with the same date, mint, grade and holder will sell for this exact value. The 1880 is the key date boasting the lowest mintage and it’s value starts at approximately $800 followed by 1879 (starts at $300), 1881 (starts at $200) and then you have the semi-key 1871 with a starting value of $70. The values for these are coins that have not been cleaned or damaged in any way. 1877 and 1878 are proof only issues and they’re both worth at least $2,000 each. 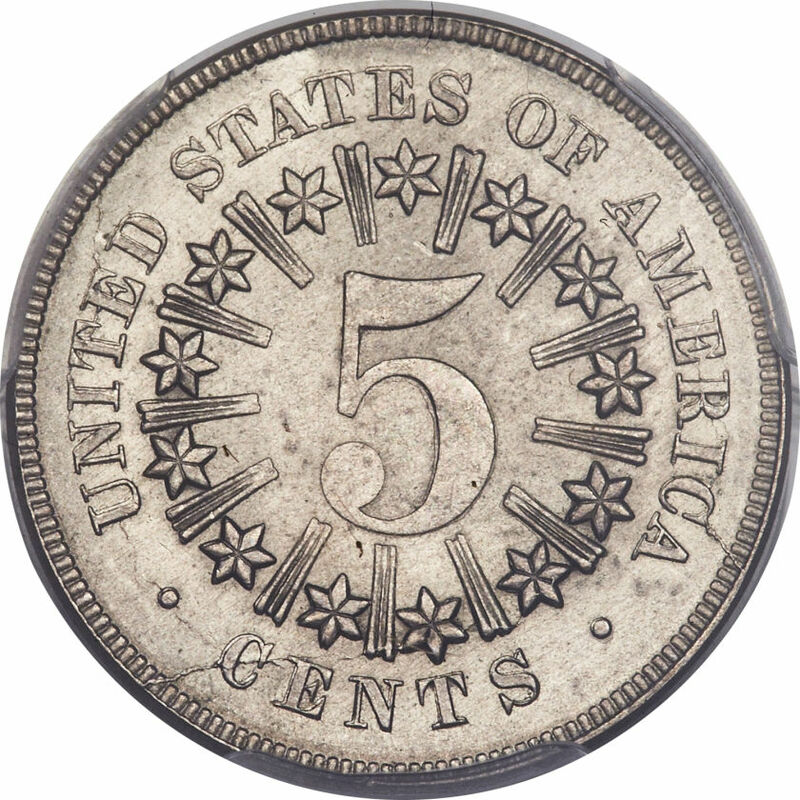 You can buy the common date Shield Nickels for less than $20 in AG3 (About Good) and $20 to $30 in G4 to VG8, but dates like the 1866, 1867 With Rays, 1875 and 1876 are a little less in mintage as common dates and they will bring more than $30 in problem free VG and continue to climb each grade. Almost all dates are worth at least $100 in AU (About Uncirculated) and most are worth much more like the 1871 is $400 in AU (About Uncirculated), so the lower the mintage and the higher the grade, the more the value. All dates are worth several hundred dollars when found in MS (Mint State) but watch out for coins that look MS but are actually AU58. You should buy graded MS examples until you can trust your own grading skills and find an honest and knowledgeable dealer. There’s a few reverse hub varieties as well as a few other variety types but they’re too confusing to go into detail here, but Cherry Picker’s Guide Volume I by Bill Fivaz and J.T. Stanton is a great resource. I will mention the most popularly known varieties below. The 1866 and 1867 Type I have reverse rays and then 1867 to 1883 don’t have rays, but it’s the 67′ with rays that’s worth the most and starts at $40 in the low grades, then you have the 1873 Open and Closed 3 with the closed 3 being the most rare and the value starts at $50. Another well known and popular variety is the 1883/2 and it’s worth $250 in the low grade of G4.